Matt Damon plays NASA astronaut Mark Watney in ”The Martian," which was released in October 2015. The sci-fi epic "The Martian" has been nominated for three Golden Globe awards — including, a bit confusingly, for Best Comedy. 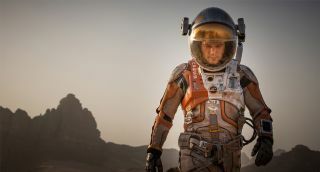 "The Martian," which stars Matt Damon as a NASA astronaut stranded and presumed dead on the Red Planet, earned nods for Best Director (Ridley Scott), Best Actor (Damon) and Best Motion Picture —Musical or Comedy, the Hollywood Foreign Press Association announced today (Dec. 10). However, there's no real reason that such a film can't be regarded as a comedy, Clarisse Loughrey, of the British newspaper The Independent, noted today. "There's sometimes an assumption that a film could only possibly qualify for the 'comedy' category if it's absolutely goofy and hilarious throughout; there's no notion that a film which still contains strong elements of tragedy and despair could possibly be considered as part of the comedy genre," Loughrey wrote. "If anything, this arbitrary delineation of genres just proves how pointless that delineation is in the first place." The 73rd annual Golden Globe Awards ceremony will take place Jan. 10, 2016.